One of the most frequent topics of user queries I am getting are legends. So let's explain some of the principles here. As you know, in GCDkit it is possible to assign plotting symbols and/or colours by several mechanisms, and these, in turn, influence the appearance of the resulting legend(s). 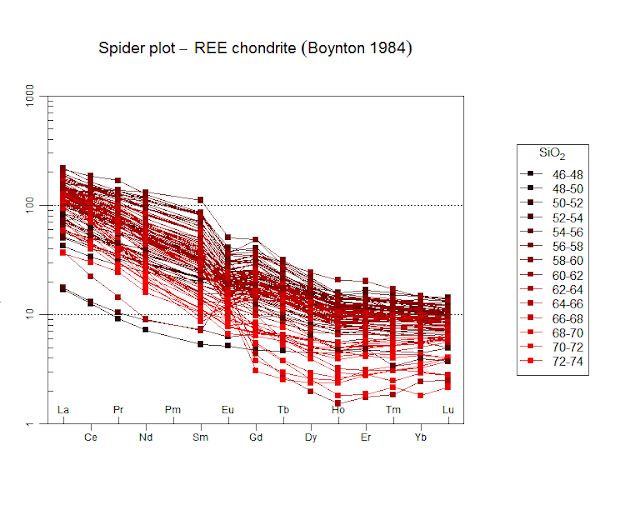 The easiest way to alter the plotting symbols and/or colours is to use the Plot settings menu. according to the levels of the currently defined groups. In all these cases, the legend is prepared automatically and invisibly by the GCDkit system. If contrasting criteria are chosen for symbols and colours, two legends are built. Here comes a bit more technical description - for definition of legends, two internal variables 'leg.col' and 'leg.pch', are used. If they differ from each other, two separate legends are created, for plotting symbols and colours. If both variables equal zero, the current grouping information is used. Otherwise these variables contain the sequential number(s) of column(s) in the data frame 'labels', whose levels are to be used to build the legend(s). Lastly, I should point out that the legend is still not correctly built when the colours are assigned by a numeric variable - a shortcoming that is fixed by the new version of GCDkit that is currently at advanced stages of preparation. Already the data files may contain specifications of plotting symbols and/or colours in columns named "Symbol" and "Colour" or “Color”, respectively. The plotting symbols can be specified either as single character strings or numeric codes, whose overview can be obtained by invoking the menu item Plot settings|Show available symbols. The colours are coded either as numeric values (1–49) or one of 657 full English (British or US spelling) names. For further information, see Help, the menu Plot settings|Show available colours or type colours() into the Console. If specifications of both the plotting symbols and colours are absent, and at least one non-numeric variable is present, the user is prompted upon loading a new datafile whether he does want to have the symbols and colours assigned automatically, according to the levels of the selected label. Otherwise default symbols (empty black circles) are used. After the data are successfully loaded, the logic that is behind the user's choice of plotting symbols and colours predefined in the file needs to be explained to the GCDkit system. This is done from the menu Plot settings using one of the four mechanisms discussed above. Perhaps the most common is a scenario in which the symbols, colours, or both, reflect levels of a single label, for instance the names of individual intrusions. Apart from diagrams that contain legends automatically, such as spiderplots, there are two possibilities how to display legend(s). First shows legend in a standalone window, invoking the menu Plot settings|Display legend attached to the function showLegend(). The second adds legend to an existing Figaro compatible plot, using the menu Plot editing|Add... legend or the function figLegend(). In the latter case, the user has to click on the position of the top left corner for positioning of the legend box.